This substantial detached house offers a rare opportunity to create a family home with on-site retail and/or commercial premises. Being just a short walk from local amenities and nearby beaches, the house currently comprises spacious accommodation with sitting room, dining room, kitchen and conservatory on the ground floor. 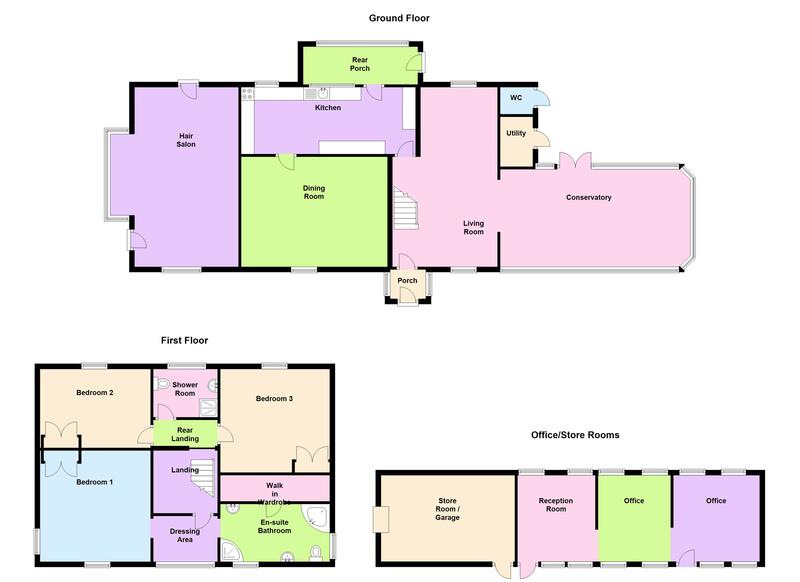 The first floor provides three double bedrooms one of which boasts a dressing room and en-suite bathroom along with a main family bathroom. Externally there is ample parking and garden area. Attached to the side of the house is a retail unit which has previously been used as a hairdressers, however permission has been given to replace this unit with further accommodation for the main house if required. To the rear is a commercial unit comprising three store/office rooms. An unusual and interesting opportunity to acquire a property with a multitude of possibilities, potential income and further development. Call Cranfords today on 243878 to book your viewing! 19' x 10'4''. Appliances include Stoves double oven, Stoves Electric hob, Sharp microwave, Whirlpool fridge/freezer, Hotpoint dishwasher, Whirlpool tumble dryer, Whirlpool washing machine, Hotpoint washing machine, Hoover commercial dryer. Mains electricity and water and drainage. Oil Central heating.